Mustique Island, an emerald charm in the Grenadine bracelet, is a superlative of Caribbean magic. Privately owned and meticulously maintained, the lush island offers solitude, security and serenity for visitors with refined and discriminating tastes. Savoring the last of my rum punch, I let out a deep sigh and watched from our verandah as a new patch of orange splashed across the evening sky. Every so slowly the tropical sun sank toward the horizon and the three of us held our breath --- There it was! The green flash! "Did you see it?" I excitedly asked my companions. "Just as the sun disappeared?" "Yes, I think so," Bethany said. "What is the green flash exactly?" Matt asked. "A mirage? An optical illusion? I mean, is it real?" "I don't know. I mean, we saw it, right? That makes it real,"
I said as I turned to see the sky burst into another new pallet of colors and the sea deepen to a mystical violet. 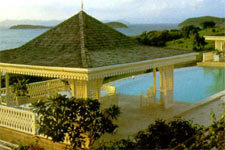 The hillsides of Mustique slowly released the golden light of the day and sank quietly into a hushed silence. Gradually from the darkness rose the sound of crickets and the gentle slap of waves on the shore. "Then again," I said, rethinking the green flash. "Think of the incredible villas we saw today. The beaches, the ocean, the hills. Pinch me, I'm not sure if anything on Mustique is real." 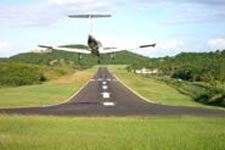 Earlier that day, the three of us arrived on Mustique via air direct from Barbados. We'd claimed three of the six seats on our tiny plane in Barbados and enjoyed a spectacular flight low over the vast expanse of the blue Caribbean. Our final approach to Mustique revealed stretches of white sand and clear, China blue bays embracing green, rolling hills. The airport, with its array of bamboo buildings and thatch roofs, was postcard perfect. Clearing customs and immigration was as easy as the tropical breeze and we made the short trip from the airport to our villa using the local form of transport -- a golf cart. 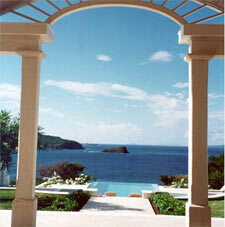 Picturesque and secluded, Mustique's 1,400 lush, green acres are a gem in the landscape of Caribbean paradises. The island was a vacant sugar plantation when Lord Glenconner purchased it in 1958. In 1960 Princess Margaret received a 10-acre plot from Lord Glenconner as a wedding gift. This land was developed into the renowned "Les Jolies Eaux" estate and the island began its tenure as an exclusive hideaway for the celebrated and successful. The Mustique Company, whose shareholders represent 20 different countries include some of the island's property owners, now owns the island. Under the company's stewardship, residential development remains carefully controlled an arrangement that has allowed nature and luxury to co-exist in a unique and symbiotic partnership. The morning we arrived on Mustique we were greeted at our villa with tall glasses of fresh fruit juice and a full, hot breakfast. The table was set with bacon and eggs and fresh bread from the island's bakery. Hot coffee, tea and an array of tropical fruits were also offered. The villas on Mustique are staffed with some of the friendliest, most professional individuals we have come across in the Caribbean. While many villa rentals around the region come with a professional housekeeping staff, Mustique villa rentals come with a dedicated staff, so the experience is very close as to when the owner is in residence. Many of these highly educated individuals are from St. Vincent and exhibit an obvious pride in "their" villas. Visitors are always greeted at the door with a cool, refreshing drink and a smile, and while it is the staff's nature to be friendly and warm, they are also professionals who can be as unobtrusive and as invisible as each guest desires. We had our laundry collected and cleaned daily, our shirts ironed with the requested amount of starch. 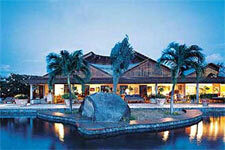 Our staff consulted with us on menu choices and prepared three delightful meals each day.